What Kind(s) of Eggplant Do You Like To Grow and/or Eat? I'm working on a cookbook all about making the most of your seasonal bounty no matter where it comes from, and I would love your input. I'll be posting random questions here every few days, and all comments are greatly appreciated. Is it just me, or are eggplants some of the most beautiful vegetables in the garden? I love the look of 'plain old' Black Beauties, but of course there are dozens of other varieties you can grow. Eggplants come in all shapes and sizes—and quite a few colors, too. The first year I gardened in Missouri I had a bumper crop of eggplant, which is what happens when two dozen plants (what was I thinking?) decide to flourish. The only trouble I had was with hungry flea beetles turning the leaves of the young plants into lace, but although they looked terrible they survived just fine. A great market variety, teardrop-shaped fruit are a lovely lilac-rose color with thin white stripes. Strong, thornless plants give heavy yields; tender and delicious. A real eye catcher. This beautiful heirloom comes from Turkey. The 3" round fruit are best cooked when they are green to light orange. This variety has very sweet and flavorful flesh. It imparts a strong, rich flavor to any dish. The small plants yield well. This variety is great for ethnic markets. Very ornamental looking. One of the most popular heirloom types, this one has 7"-long fruit that are white, with lovely bright purple stripes. They are so beautiful and have fabulous flavor, with sweet, tender flesh. This excellent variety hails from Spain, a country that is renowned for fine food. So what are your favorite varieties of eggplant to grown and/or eat? And what do you do with bounty left on the vine that's a little past its prime? Cook, curse, compost? © Copyright 2009 FarmgirlFare.com, the inquiring foodie farm blog where it's quickly becoming obvious that I won't always have appropriate pictures to go with my questions, so when that happens I'll simply post random garden photos (rather than no photos) from my files, like this one of the annoying but cute Topaz relaxing in a raised bed as if she owns it. Garden Question: Using Soil Block Makers When Starting Seeds Indoors—Yay or Nay? So I'm thinking of buying a soil block maker, and I'd love to hear about any experiences you've had with them. Have you ever used a soil block maker? They're also called potting blocks, and I discovered them ages ago in the Johnny's Selected Seeds catalog but never actually ordered one. Then last year I read an interesting article about soil block makers in the special March gardening issue of Martha Stewart Living (which can be found online in its entirety here). When I was re-reading through that issue the other day and came across the soil blocks again, I figured it was a sign that I should finally take the plunge and just go order one already. So what exactly is a soil block maker and why do gardeners love them? Here's an soil block intro from PottingBlocks.com, which bills itself as "The world's resource for soil block gardening:"
Potting Blocks, also known as soil blocks, are free-standing compressed cubes of potting soil which hold their shape without any container. 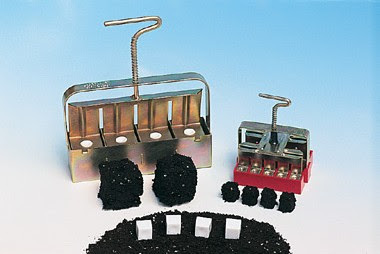 Potting Blocks are made from a zinc coated stainless steel Soil Block Maker, much like an ejection mold. The block maker metal form is packed into a tub of pre-moistened potting soil and then discharged into nice, firm, blocks with a pre-drilled seed or transplant holes formed right into the top. Potting Blocks are used for seed starting or germination, and transplanting. They have an amazing success rate due to the volume of soil compressed in the cube. The roots are naturally "air pruned" due to the air barrier of the "container-less" cube. They become the growing medium and the container! They are used for everything; herbs, flowers, vegetables, cuttings, and other transplants. Potting Blocks have many advantages over traditional potting methods. First, they eliminate transplant shock! The seedling and root system stays intact and protected, a "home away from home". They will not become "'root-bound". They eliminate root circling. They replace plastic pots, trays, inserts,etc. They contain more cubic volume of soil than pots of the same top dimensions. They promote great air circulation. They have a major increase in space utilization than round pots. And, studies in Europe have shown that Potting Block transplants are superior in performance than container-bound transplants. They sound pretty great, huh? Kind of makes me wonder why I didn't start using them ages ago. Soil block makers are available in several sizes, from itty bitty to big and pricey commercial versions. I'm thinking of starting with the 2" x 2" 4-block size, which can be used for all sorts of seedlings. 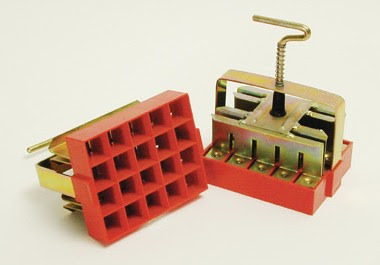 If I like how it works, I'll invest in the 3/4" x 3/4" 20-block maker (pictured above) and four soil block maker inserts. Each insert makes a defined 3/4" x 3/4" impression in the 2" soil block, perfectly sized to insert a mini block. How convenient is that? There are many economical and environmental reasons to use soil blocks when starting seeds, and the only outlay of cash is your initial purchase—unless of course you become a soil block addict and need to acquire one in every size available. Apparently making the soil blocks is a lot of fun. There are different opinions as to the best kind of 'soil' to use when making blocks (some gardeners use compost, others say you shouldn't ever use compost), but everyone seems to agree that they're a wonderful invention. I'm looking forward to finally jumping on the soil block bandwagon—especially since I'm already behind with my seed starting this year. So what seeds have you started already? And what did you start them in? © Copyright 2009 FarmgirlFare.com, the germinating foodie farm blog where seeing seeds sprout up—whether in containers or directly in the ground—is definitely one of the most rewarding aspects of gardening. Right after eating your bounty of course. You Know I Love to Use Sheep Manure in the Garden. . . But this is a little ridiculous. Happy Valentine's Day! So what things do love growing in your garden the most? You can read more about using sheep manure as an organic fertilizer in the garden here. © Copyright 2009 FarmgirlFare.com, the garden loving foodie farm blog where most of the hearts I find around the farm are made out of rock, but this one that flung itself into the haycart with the first pitchfork full of manure hay mucked from the barn has got to be the most memorable—and the funniest. I've been wanting to write about raised beds since I started this blog back in 2006. I decided to start growing in raised beds when I moved in with my hunky (and handy!) farmguy Joe nine years ago and had the chance to create another new garden from scratch. I'm so glad I did, and unless I decide to plant an acre of something someday, I doubt I'll ever go back to gardening any other way. I even have raised beds in the greenhouse. There are many reasons why I love my raised beds, and many of you have been asking me to tell you more about them. But because it's obvious that I'm never going to get around to writing one giant raised bed blog post, I decided I should tackle the reasons one by one instead. They look beautiful when they're covered with snow. I'm also looking forward to sharing tips about creating and using raised beds in the upcoming months. Are you a raised bed gardener? Feel free to jump into this new ongoing discussion anytime! And if you've written about raised beds on your own blog, you're welcome to leave a link to the post(s) in a comment below. © Copyright 2009 FarmgirlFare.com, the foodie farm blog where the other nice thing about snow on raised beds is that it even makes all the fall cleanup you never got around to doing look good—and it takes away the guilt, because how can you be expected to go out there and pull up dead weeds when you can't even see the ground? Winter can be so handy that way. Of course I probably won't be thinking that when I'm scrambling to get these beds ready for planting lettuce and beets (and hopefully a bunch of other stuff) in March.